William Shakespeare returns to Stratford and struggles with retirement. Kenneth Branagh quite likes Shakespeare. Actually, that's a bit like saying Orson Welles liked dessert, or Oliver Reed liked a tipple. Throughout his career, on both stage and screen, Branagh has sought to bring the work of Shakespeare to the masses, directing screen adaptations of Twelfth Night, Henry V, Much Ado About Nothing, Hamlet, Love's Labour's Lost and As You Like It. It was inevitable that at some point Branagh would play the Bard himself. And so we have All is True. 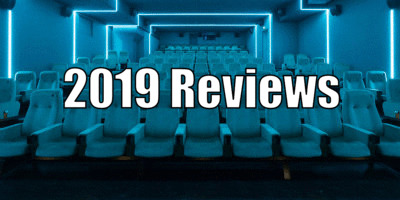 Scripted by Ben Elton, whose recent TV sitcom Upstart Crow also follows the travails of a put upon William Shakespeare, All is True surmises how the English language's most famous writer's retirement years might have played out. Following a fire that destroys his beloved Globe theatre during a production of 'Henry VIII' (the alternate title of which was 'All is True'), Shakespeare returns to his Stratford home. Having made few trips home over the past decades, Shakespeare is given a frosty welcome by his wife, Anne (Judi Dench), who consigns him to a separate bedroom. To keep himself busy, Shakespeare sets about constructing a garden to honour the memory of his late son Hamnet, taken by the plague at age 11. The writer's daughter, and Hamnet's twin, Judith (Kathryn Wilder), has grown resentful towards her father, who she believes wishes it was herself who perished rather than his son. With Judith resigned to moping around the home, Shakespeare pins his hopes of a grandson on his eldest daughter Susanna (Lydia Wilson). Back in the '80s, when viewing figures were measured in the millions rather the thousands, it was often said that Dallas and Dynasty were the Shakespearean dramas of their age. Both those shows based their format on the family melodramas of the '50s, as does Branagh for his latest film. With its soapy familial conflicts, All is True plays like a Jacobean era Douglas Sirk drama, minus the unique passion of Sirk's films. The drama in Shakespeare's home life is a million miles away from the grand conflicts of his famous plays, and subplots like Susanna's possible affair fade away as though half-excised from an earlier, meatier draft of Elton's script. As much of the film focusses on Shakespeare's guilt over the loss of his son, and how his work kept him at a distance from the boy, it's difficult not to compare it to the recent under-rated A.A. Milne biopic Goodbye Christopher Robin, which handled the same theme in a far more affecting and convincing manner. A late revelation concerning the manner of Hamnet's passing makes Shakespeare appear something of a moron for not putting two and two together at the time of the child's death. 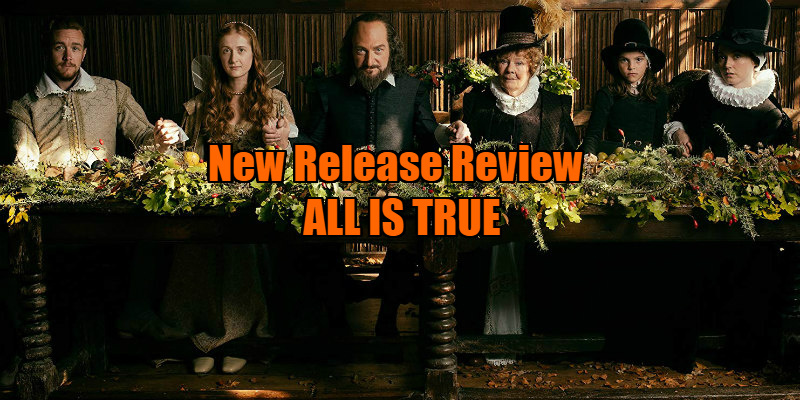 All is True struggles to find a plot hook worth hanging its cloak on, Branagh and Elton jotting down numerous half-baked subplots only to crumple them up and toss them in a waste-basket. There's a potentially great conflict between Shakespeare and his son-in-law, a puritan who believes that all theatres should be closed and that the populace should be reading the bible rather than romantic sonnets, but the film never bothers to explore this dichotomy. Branagh is an affable presence, perhaps too likeable for his portrayal of Shakespeare as a neglectful narcissist, and it doesn't help that his performance is weighed down by a ridiculous make-up job that gives him the appearance of Ben Kingsley playing Guy Fawkes in a Christmas panto. Considering how disinterested his film is in fealty to its subject, containing as it does many details disputed by historians and anachronistic language and attitudes, it's odd that Branagh insisted on trying to look so much like the Bard. Though largely listless and at times positively coma-inducing, if you can keep yourself awake there are a few worthwhile moments in All is True. The highlight is a meeting between Shakespeare and the Earl of Southampton (Ian McKellen, whose blond wig and whiskers make him look like he's playing the Cowardly Lion on a Wizard of Oz themed gay pride float), the object of the writer's affection, according to some experts. Slapping their metaphorical meat and veg on the table, the two actors indulge in a Bard-off in the British luvvie equivalent of Pacino and De Niro's encounter in Heat. Elsewhere there's a beautifully staged scene in which Branagh discusses his love of writing with a servant girl while marking out his garden, the actor/director timing his blocking with the precision of Sammy Davis Jr shuffling between instruments in one of his more show off performances. Some gorgeous candlelit compositions are a reminder that when he's not helming milque toast blockbusters, Branagh knows how to make a movie pretty to gaze upon. Such moments are rare however, making All is True a struggle for all but the most committed of Shakespeare fans, who may well take umbrage with Branagh's account of their idol's late years. 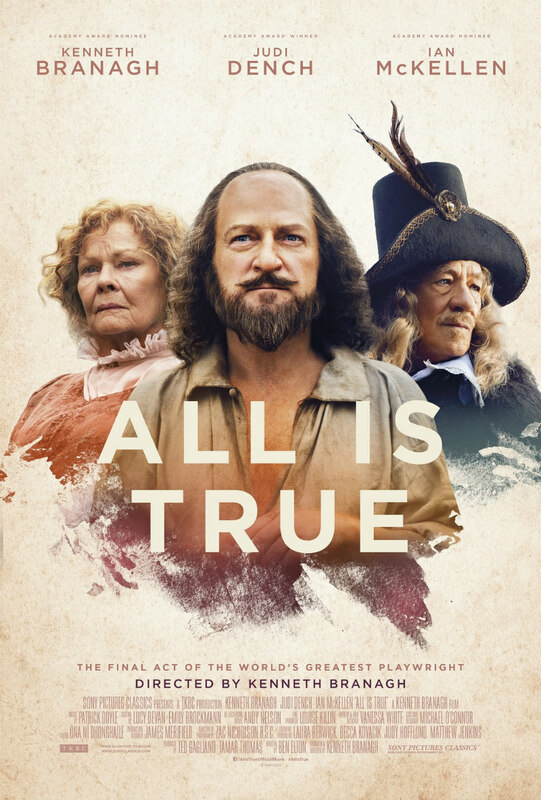 All is True is in UK/ROI cinemas February 8th.